The AOR team debates whether to drop Handre Pollard from the team to face France this week in one of several tweaks to gauge the quality of the Boks’ depth. Coach Rassie Erasmus might be losing sleep over a few selection posers, but those are becoming fewer and fewer as he goes about building squad depth in a mostly convincing fashion. The thing keeping his chemist on speed dial, though, is around what he would do if Handre Pollard got injured. This not because he does not have options – Elton Jantjies is growing into his role off the bench, while Damien Willemse remains a diamond, albeit an unpolished and unknown one. It’s the fact that all three have different strengths, and thus play very different games. And with Erasmus having picked the one who takes it up best from a flat starting position, the Bok game plan, at least for the first 40 minutes, revolves around that particular skill. It certainly worked for Nick Mallet when he had Henry Honiball in a similar role. It’s the reason I think the coach should be exposing Rob du Preez to the Bok system, as it would give him more of a like-for-like replacement should Pollard go down. A story for another day though. So choice made, and with Pollard available, pick him every time. He is the Bok commander in chief. The surprise availability of Faf de Klerk delivers a bit of a catch 22 situation, but if in Rassie’s shoes, and given how little game time the back up scrummies have had, I would stick to giving Van Zyl, Papier and Schreuder starts. What a bonus to have Faf coming off the bench should it all go Pete Tong! Up front Schalk Brits and Vincent Koch must get game time. I’d have them off the bench with Malcolm Marx Marx and Wilco Louw starting. Trevor Nyakane would then replace Thomas du Toit on the bench. The Boks know exactly what they’ve got at flyhalf in Pollard, and it wouldn’t take much waterboarding for Rassie Erasmus to admit that Elton Jantjies is, at best, an emergency option. Damian Willemse will be the 10 that takes South Africa to France in 2023 – even Stevie Wonder will tell you that’s signed, sealed and delivered. 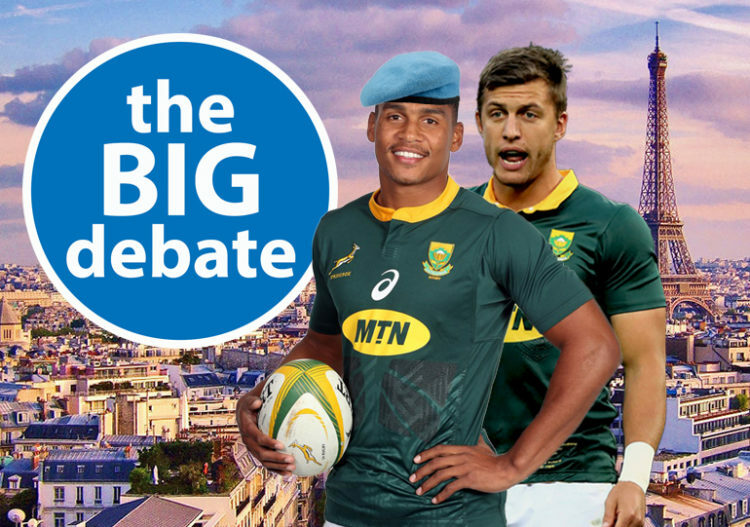 Coincidentally, the Boks are snacking on crepes in Paris this week, and a tilt against Les Bleus offers Erasmus a waning opportunity to develop Willemse into Pollard’s wingman for the 2019 Rugby World Cup. Not since Frans Steyn has South Africa produced a gamebreaker of Willemse’s elite potential. Prodigiously talented but raw, this kid needs to play, and play in a hurry if the Boks want to have him fully installed for RWC 9.0. There will be issues that require troubleshooting, but now (not September next year) is the time for debugging. Some might say Pollard should start so that Erasmus can continue the search for a capable backup scrumhalf, but the flyhalf depth chart is much closer to being solved and better to successfully tick at least one box on this tour. Recall Faf de Klerk to partner Willemse with Damian de Allende and Jesse Kriel making the calls from the outside in. Also bring back Willie le Roux to fullback, and pencil him in as the reserve flyhalf if Willemse is unable to play to the final whistle, in which case Gio Aplon (highly respected in France) comes on at 15. Give Pieter-Steph du Toit a deserved rest, wrap Eben Etzebeth in cotton wool and, in the quest for answers, trial Lood de Jager and RG Snyman in the second row with Franco Mostert at 7, Siya Kolisi at 8 and Duane Vermeulen at 6, and start Trevor Nyakane at loosehead next to Bongi Mbonambi and Vincent Koch. You’ve read what they think, now it’s time to let us know whose side you’re on! I think Willemse needs another season at 10 for the Stormers before we expose him to the pressure at 10. He hardly set the world on fire at 15 against England, even though it seems that he was coached that way. Don’t pressure the kid like we did Gaffie du Toit or Derrick Hougaard. Pollard is really finding his stride and Jantjies also looked good off the bench. Let them take the team forward. Regarding Zelim’s selections, I think we need Duane at 8 and Kolisi at 6. Duane is much better at 8. I agree to give Du Toit and Etzebeth a rest and let Lood and Snyman start. We need someone at 7, though. Pity that JL du Preez stayed at home. As good as De Allende was getting over the gainline, as bad was he with passing. I’d give Esterhuizen another chance at 12 (maybe to show off some Farrell tackling, LOL) and Kriel at outside centre (do we have another choice?). It’s a pity our centres can’t pass, because we have such dangerous wings. Let’s hope that improves against France! Zelim, Stevie Wonder was blind! You surely know that? Here we go again with the Cape Journalists punting Willemse. For Pete’s sake Zelim, read Oom’s report from yesterday. He showed some serious flaws in the less pressurised position of 15, so the solution to this would be to increase the pressure and play him at 10! You also seem not to be in touch with the Currie Cup 2018. He was dropped at provincial level by Dobson from both 15 and 10! He can’t hold down those positions at Provincial level, but you want him in the national side??? Why is it that people have such little respect for the National jersey, where youngsters are given repeated opportunities based on “Future Potential” rather than form? Interesting thought Tank. Why not Rob Du Preez? The problem is mainly that he does not exhibit traits of flash and panache, so he is assumed, by the SA public as pedestrian. The reality is that apart from the fact that he plays on the gain line, is that his greatest strength is his ability to put players on his outside into space. Both Esterhuizen and Louw have looked impressive as a result of this! Again, referring to Oom’s report of yesterday, it is an area that Pollard is battling a bit with! But its not to be, because simply Rob is not in the squad and more to the point, he is now working on securing his future in the UK with a three month stint at Sale. Yet another good one let slip the system!! Replicate a pollard game? Like missing sitters right in front when your team is one point behind? Like that game? if you’re referring to the charge down in the wales game maybe it would be fair to consider that he had no protection from the forwards. Another thing, the ‘slow’ pass release is specifically what creates the space for his centres. On the other hand Willemse has not been good in his positional play at full back. The final AB try in Gauteng was a result of him not being in position but trying to play flyhalf instead of full back. Consider too that in two previous games he was directly responsible for tries against the Boks – but not a word? The positional issues were very apparent in the England game as well. Agreed Greg , the responsibility for the clearance kick against Wales was Papier’s, but instead he hospital-ed his fly half. I suspect though that we are flogging a dead horse. They have invested so much time and support in Willemse that they are almost obliged to force a success out of it, lest the napkins come into play and the egg gets sorted! Yes agreed, but a moot point really, there aren’t other options in the squad. I doubt willemse will surpass Pollard for 2023 because pollard will still be in his prime in 2023 and Willemse has no kicking game at all. Wileemse must try focus on FB for now. I like where you are both going in terms of changing the side up. We need depth at 2,9 and 15 and we not doing much to create it. “Damian Willemse will be the 10 that takes South Africa to France in 2023 – even Stevie Wonder will tell you that’s signed, sealed and delivered.” Zelim disagree’s, and he’s asked Stevie, and Stevie knows all haha what a joke. Go Zelim! Will Willemse become one of SA Rugby’s great no 10’s? NO. He has too many flaws in his game. Imagine that when they are all in their prime and in a 2nd world cup. Perhaps that is Rassie’s goal here? And by then Papier might also have about 80minutes of international rugby under his belt. That would be a great backline and tick certain boxes I think. Think about the youth in this Bok team. Many of the current group will be at their prime by 2023. The scary thing is how good these players are right now. With good coaching and dedication, they could be the best team in the world by 2023. Just a thought to be optimistic. That’s a nice back-line there Albert. We just have to try to find a way to keep some more players in SA. Willemse can do better at 15. Less pressure, and more space. And if he can take a little more control of situations, then he might even be magical. Unfortunately he is still a little inexperienced and struggles to assert himself. So until he begins to assert himself and make the calls, good or bad, he will stay second fiddle fullback. Could be a great flyhalf if he just starts making the calls instead of being afraid of making mistakes. On the other “trails” that you guys mention I do agree. Especially PSdT and Etzebeth. PSdT needs a break, and Etzebeth recently returned from a long term injury. We don’t want to cause another one. Willemse is only 20 years old guys, let’s all calm down. Most commenters on here are expecting him to be doing things and handling situations that even seasoned test match players still battle to do consistently, give the kid some time and allow him to make mistakes.. Ofcourse the argument will be ‘well he should gain experience at super rugby/currie cup’ but then again hez in the bok squad because he is better than the other players in his position but just inexperienced..
No actually Tobo, that’s the point you guys keep skirting! He was pretty average at SR level, if you care to recall he was seriously shown up by the Chiefs just before injury. Curwin Bosch had way better stats than Willemse in SR, but Willemse got the call regardless! In his first test outing, against Argentina you may wish to recall him panicking and throwing a wild pass that resulted in 7points against. He followed this up in the third test against AB’s when he was playing FB and was out of position. A further 7 points against and in both circumstances losses that shouldn’t have been. More recently he was dropped at both 15 & 10 by John Dobson, so prey tell us where this super form is that we keep getting shoved up our noses? My views are not Provincial either, I strongly supported a call up for SP Marais. He was outstanding in the Currie Cup and deserved recognition. Anyone of Marais, Bosch or Leyds showed more recent form and are way more deserving. You got it right first off, you learn your trade at club or Provincial level, not in National colours. Most of us have more respect for the National jersey than that! SP Marais had a solid boot the whole competition. I think thats why he was picked. I must agree with Zelim. I think we know a lot about the starters and some need to rest or need to get on the skills training pitch. We do need to test the fringe players and combinations. Our issues are with our backline at present, so it makes sense to properly test our 3rd choice 10 while building the first choice 9, 12 and 13. And of course, having Willie will always take some pressure off the 10. Dyantyi and Nkosi pick themselves. In the forwards, Zelim is spot on. We need to rest PSDT and Etzebeth. And it is time to test Mostert at 7 i would say. No reason he can’t lead the lineouts from there. Ditto front row, Nyakanye and Koch seem to be passengers and need to be tested and either sent packing or developed further. But thankfully I am not the coach so there is no responsibility on my shoulders for the selections. Nothing wrong with Bok skills, the brilliant skills they showed against the all blacks and especially against England in the 1st two tests in June don’t just suddenly evaporate in the space of a few weeks. The problem we ith the Boks is a mental one. One week they seem very switched on and the next week they are 5% off where they should be and that makes a hell of a difference in international rugby. It happens to most teams to be fair with the exception of maybe the all blacks..
Rassie will pick his best possible team, Pollard will start with Faf. If we had beaten Eng convincingly there might have been room to fiddle around. Rassie knows from here on he’ll have to make it 3 out of 3 in order for this tour to be a success. If Eben feels ready to he will be picked! cant imagine Erasmus staying with Duane at 7! Yes agreed, they need to win! So your mix is probably close to it. Both Kishoff and Kolisi had pretty average stats against England. Interesting to see if that leads to any change? Rassie knows what Kollisi and Kitshoff are capable off, reckon he will stick with them! Yep we are on the same page. I’m more with Tank on this one where Du Preez as Pollard’s backup is concerned. To tinker with the combinations, as Zelim suggests, could potentially be a disaster. If they get the jump on us we could end up chasing the game and we all know what means. I think Rassie’s priority is to beat France and he will pick his best side with very few changes from the starting side against England. Maybe Duane at no 8, PSDT at 7 and Mostert and RG as the locks. Nigela to ref the Boks vs France game. Hopefully he’s up to date with the new tackle laws!!! He’s usually really good but he was a bit home side-ish in the Wellington test! Sweetaz,….A man of many sides. Racist. Homophobic. What’s next? Tank is obviously happy with this kind of vomit on his site too. It’s been up here for the last few days. The only reason Jantjies doesn’t come into the reckoning by the writers and most of the posters here is simply because the coaching staff intend playing dom krag rugby at the WC. Swys is wasted in the Bok camp and the rest of them are domkraggers of note. If you don’t believe me watch Saturday’s test again. Pathetic stuff and Farrell had nothing to do with it. We now have three failed coaches in a row, HM, AC and now Rassie who clearly has not learnt from his predecessors. If you’re looking for a creative flyhalf then we have only one genuine contender in this country, Teflon EJ. If dom krag is your game put all the rest of the names in a hat and play the pick. I assume if you do that you are happy to continue losing because at the moment Rassie’s win ratio is making AC look like a coaching genius. ( 2017 – AC only 4 losses in 13 tests. 2018 – Rassie 6 losses in 11 tests ) Spot the weakest link. Cheers.